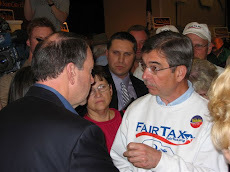 As a follow up to the Washington Tea Party Report message from Sunday night I share with you below two eyewitness accounts (both from FairTax supporters) & just three of the responses I received (with a few comments from me in red). The crowd size has been widely estimated from 75,000 to 2 million people. A calculation based on elevator space required by a human being taking into account Pennsylvania Avenue's 1.2 mile length & 160 feet width results in over 400,000 people estimated. Just look @ the above photos & you know it was a lot of people & from the various accounts we know they came a long way @ quite an expense of time & money. A tremendous example of dedication & patriotism. 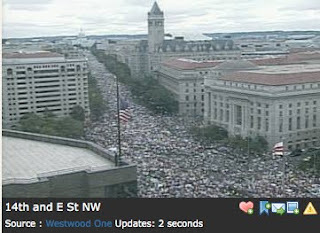 Regardless of the exact size it can safely be said that this is the largest protest assembly of BO's presidency. So like in the earlier message the question remains why did this event not get more media coverage? The answer is obvious when you understand how much the media is in the tank for BO in their desire to establish a statist society in America. This lack of coverage is just another example. The lesson from this Tea Party event is two fold - 1) Do not financially support, read, or watch any news organization that does not share your values for America, & 2) do support people who work for America @ Tea Party & Town Hall meetings - in fact participate yourself the next chance you get. There were approx. 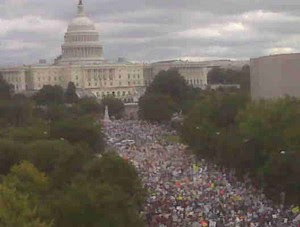 2 million people in DC and when you hear them sing patriotic songs and chant USA it makes you proud. 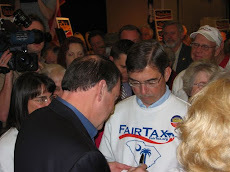 There were people from FairTax.org from all over the country. We spoke to as many people as possible. It was a good day. With re to me questioning the count being lower - @ that time maybe but people kept coming. The march was to start @ 1 pm but started several hours early. There were thousands that came all day long. Glenn Beck showed a side by side on Jan 20th and there were far more people on Saturday. Independent news said over 2 million. I've seen the pictures. And the larger figure sounds right. They had areas blocked off to rally goers. There wasn't a spot to be had on the streets and the green. As you know I was at the Tea Party this weekend in Washington D.C. I drove to Washington on Friday morning and spent the weekend returning Sunday night. As usual the broadcast media gave very little coverage if at all this event. 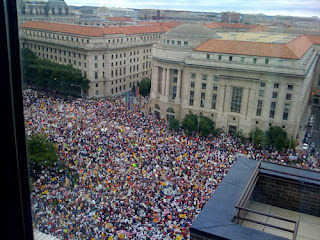 Some cable news sources estimated the crowd at one thousand or so. There were more than one thousand people in my hotel, and nearly all of them were from Alabama. They had arrived Friday afternoon by bus, made signs in one of the meeting rooms that night. This group went to the Tea Party, stayed all day, returned to our hotel and waited three and a half hours for their bus to arrive to head back home. All on their own money, no meal vouchers, no payment just a commitment to do the right thing. Saturday morning the lines for the metro (subway) ticket machines were six to nine people waiting in line at my stop. I spoke to a friend of mine at another station, it was worse there. The ticket system could not keep up with the number of people. Machines were out of service because they were FULL OF MONEY and could hold no more. Metro cars were packed solid; the average wait to get on a car was forty five minutes. I was lucky, a bit of pre-planning by purchasing my metro card the night before was a good idea. As I am physically challenged, I did not have to wait long for a car, I waited about three minutes. How many people were there? I did not have a counter but the traffic on the highways leading into D.C. were at a standstill for hours, streets in our capital were no better. Pennsylvania Avenue was closed for nearly four hours due to the overflow of people that could not find space on the mall. The police had to ask the crowd to disperse so vehicular traffic could flow again on Pennsylvania Avenue. If it was one thousand, one hundred thousand, one million or more the point is many people are not happy with this administration and the people at Capitol Hill. They let it be known that change may be needed but to tear down and restructure our entire form of government just doesn't make sense. PS - One thing I forgot to mention. The D.C. Metro (subway) reported that they served 2.5 million riders on Saturday. For all those who claim there were only a few thousand people at the Tea Party...............where do you think the rest of the people were ? On The White House Tour? One great response: Thanks for the report...so happy to see such a large turnout...have been following this event on Fox. Hmmmm - proves a point. "Accordingly, why would you want to support an obvious hostile anti-American media that wants to filter news to you that benefits everyone but you?" They better start listening to these TEA partiers -- The Government underestimates America's rebelliousness. A distinct possibility in such a divided land. My niece was there from Maryland with a group.